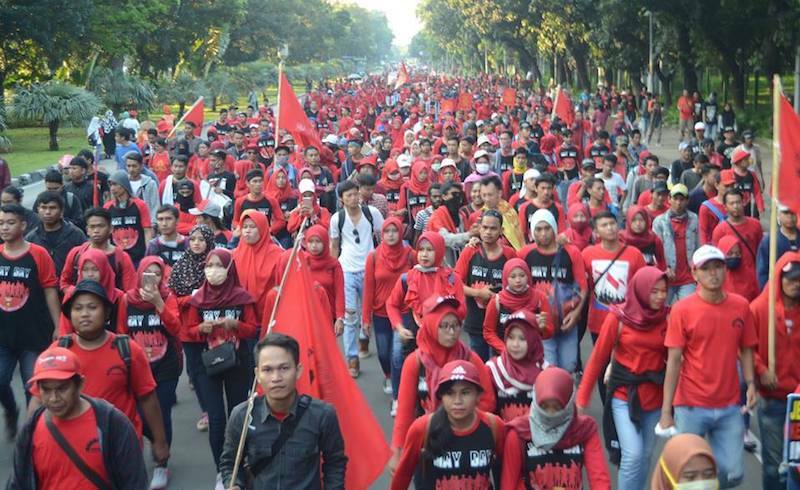 A progressive union contingent marches in Jakarta on May Day, 2018. via Serikat Buruh Demokratik Kerakyatan (SEDAR). May 21, 2018 marked the twentieth anniversary of the fall of the dictator Suharto, who ruled Indonesia from 1965 until 1998 — 33 years; a very long time. This 33 years constituted a massive percentage of the time Indonesia has existed. The leadership of the national revolution proclaimed independence on 17 August, 1945 but the colonial power, the Netherlands, was not forced to take its soldiers and bureaucrats home until the end of 1949. Its capitalists remained dominant there until they were expelled between 1956-1958. The effort to consolidate a new nation and a new state only began in 1950. The challenge of consolidation in the first years was greater for the nation — a new community — than the state itself — the congealed power of a (capitalist) ruling class, who faced no immediate threat from any other organised class force. In Indonesia’s case the process of creating and then consolidating a nation had begun late. The period of gestation only began at the turn of the 20th century — the subject matter of the historical novels of Indonesia’s greatest novelist, and revolutionary thinker, Pramoedya Ananta Toer. Prior to this, civilization in the Malay Archipelago, known as Nusantara in the region, was a mosaic of societies at many different levels of social development. The development of the embryo of the new community out of the myriad of scores of differing societies only advanced in the 1920s — only 30 years before the proclamation of Independence. Propelled by the evolving material conditions throughout the Netherlands East Indies, producing a common economic life, a common language and literature and a new common culture, embodied primarily in its politics, the process of nation-creation was further enriched as the ideas of three revolutions — the bourgeois revolutions of Europe; the anti-colonial revolutions of China, the Arab nation, and the Philippines; and Russia’s social revolution — were fused. With varying degrees of consistency, these ideas were taken up as the national revolution’s ideological weapons. It was a powerfully creative process, enough indeed to forge a new community with a new culture, while also being eclectic, uneven, messy, and unfinished. Thus the challenge faced by Indonesia’s social classes in 1950 to consolidate a nation was extraordinarily daunting. Furthermore, in 1950, it was still unresolved which class would lead that process: the underdeveloped capitalist class borne of colonialism or the equally underdeveloped proletariat, a miniscule proportion of the population compared to the ocean of poor peasants who were embedded in a huge variety of differing exploitive agrarian social relations. The period between 1950–65 was one of deepening contestation over this question of which class would lead the nation creation-consolidation process: a process which the country’s preeminent political leader, Sukarno, called revolutionary “character-building” and “nation-building." Suharto came to power in 1965 in events that brought this contestation to an end, by burying it via a genocidal wave of systematic mass killing and terror, repression, and a drastic dictatorship over historical memory. The 33 years of Suharto’s rule, therefore, in some ways represents 100% of the existence of the nation-state now known as Indonesia. Of course, this 100% is not 100% true. There are buried legacies in the memories of past struggles, many recorded in literature and political writings, and indeed also in the string of struggles since 1965, especially that of 1989–1998, which ended the dictatorship. Buried legacies that need to be dug up: are being dug up. With this history, it should surprise nobody that it is only after 20 years that we might be seeing the first, very early signs of a resumption of the contestation buried in 1965. Even the word resumption disguises the reality: it is really beginning anew. New radicals, especially among the youth, must explore to discover even where to dig up the legacies they need. But all the signs are there. They include the resilience of the works of Pramoedya Ananta Toer about the genesis of the struggle for Indonesia; the success of the people’s history oriented monthly magazine, HISTORIA; the steady, if still gradual, growth of independent publishers of history and progressive politics and the popularity of their books among restless youth. And in April, 2018, in Jakarta, there occurred the Indonesian Peoples Movement Conference. This was the first large gathering of the social justice and democratic rights activist spectrum — trade unions, farmers groups, democratic rights organisations, feminist groups. There were over 50 organisations. It was initiated by 5 of the most active progressive trade unions, many of which emerged after 1998 among that small section of the workforce concentrated in the factories and larger workplaces. There was a consensus that a united political vehicle was needed respond to an increasingly effective, if still small, right wing spectrum of forces. There were debates, of course, over the nature and character of any new united political vehicle. The next gathering in a few months intends to bring even more such groups together. While there was no explosive post-dictatorship momentum after 1998, there has been a gradual but steady process of beginning a resistance from scratch. It is too early to say whether this particular initiative will succeed in building momentum, but it is not too early to say that something new is again in gestation.